Famous composers, of whatever period of musical history, have never been neglected by writers. They have been the subject of critical assessment from every conceivable angle: purely musical, social, political, personal or whatever other aspect of their creativity has appealed to writers through the ages. Their music has provided material for students and intellectuals to research in the pursuit of doctorates or other academic endeavour. Much of this tends inevitably to be repetitive; later researchers quoting from earlier investigators. On the other hand the lesser or almost totally unknown composer is sometimes championed by an over-enthusiastic admirer who, seeking to redress the general neglect of his chosen subject, is often inclined to lack perceptive insight and thus present an ill-balanced, uncritical eulogy. It is particularly welcome therefore, to have such a book as this about a composer who is little known, yet written in a way that does not irritate or antagonise the reader by a too-effusive or gushing enthusiasm for its subject that can all-too-easily arouse a suspicion of incredulity or disbelief. Geoffrey Self's book does not fall into any such trap as this. It is thoroughly researched and most lucidly presented. It recognises the shortcomings of Moeran; the personal problem he apparently had had with alcohol, and as the author points out, the probable cause of this, the head wound he had suffered during the First World War. It had never been this commentator's good fortune to meet Moeran, but certainly remembers being impressed by reading a "Musical Times" article which reviewed in great detail the Symphony in G minor shortly after its first performance in l938. As a schoolboy at that time, I did not by any means understand much of that long article but became sufficiently aware of the fact that it must be a great work. A personal interest was thus kindled; occasional radio performances could be heard during the war years - one such was indeed memorable, heard in an army barrack-room in Hanover (when most of the other lads were out on the town!) in late 1945. From that moment on it became a quest to hear it again, but it was not until the Festival of Britain in 1951 that a chance came to take part in a performance of it at the newly-opened Royal Festival Hall. The Scottish National Orchestra under Walter Susskind, rehearsed it several times in the previous weeks, but curiously only ever gave this one performance. Since then I have never heard another live performance by a professional orchestra, but have conducted it with a good amateur orchestra during a summer week-end orchestral course. About this time, however, the early 1950's, some of Moeran's other music was performed by the SNO, notably the "Overture for a Masque". Could such subtleties of personal musical analogy suggest yet again the existence of those indefinable, yet tantalising traits of unmistakable musical meaning we all recognise? This book by Geoffrey Self underlines this so cunningly and it is surely one of the things that makes it a truly great book of musical scholarship. The final chapter discusses the question of Moeran's originality. Few composers have ever been, in one sense, truly original; for we all take over from our predecessors the essence of a universal musical language. Some composers do indeed invent a musical language and grammar of their own, and in the long run such new means of communication often takes root and are eventually understood by those who want to follow. In the main however, a large majority of composers, and probably even an even larger majority of performers and listeners respond more positively to a language that is universal in its syntax so that in this way very few of us, perhaps none, can be said to be truly original. What we do is take existing musical language and mould it to our own personal way of expression. Avant gardistes tend to be contemptuous of this approach, demanding absolute originality at all costs. 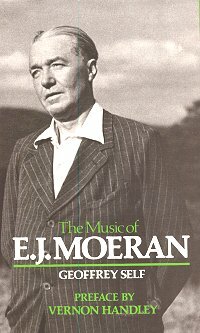 Moeran would not claim to be original in this sense - why should he - but his utterances within the lingua franca of English music are personal and, to the listener willing to explore, quite unmistakably reveal a voice that is his own. The analogy has often been made with finger prints; each one of us is unique in this respect, yet the apparent surface pattern or design of finger-prints looks pretty universal at first sight: they are all of the same kind; only careful comparison reveals they are each one different. A notable feature of Moeran's harmonic language is the way in which a sunny phrase can suddenly become darkened, as if it were the musical equivalent of a chill dark cloud so suddenly occluding the warm sunlight of a moment before.